Structures of terfenadine and known metabolites formed in mammals by CYP3A4 (Jurima-Romet et al., 1994; Ling et al., 1995; Rodrigues et al., 1995). 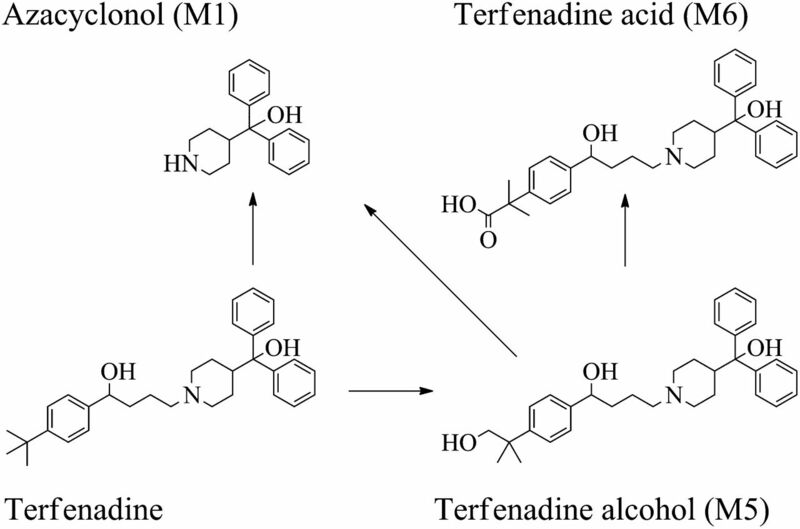 Response of terfenadine and known mammalian metabolites after administration of terfenadine to locusts with and without coadministration of inhibitors. Data are means and S.E.M. ; n = 4. 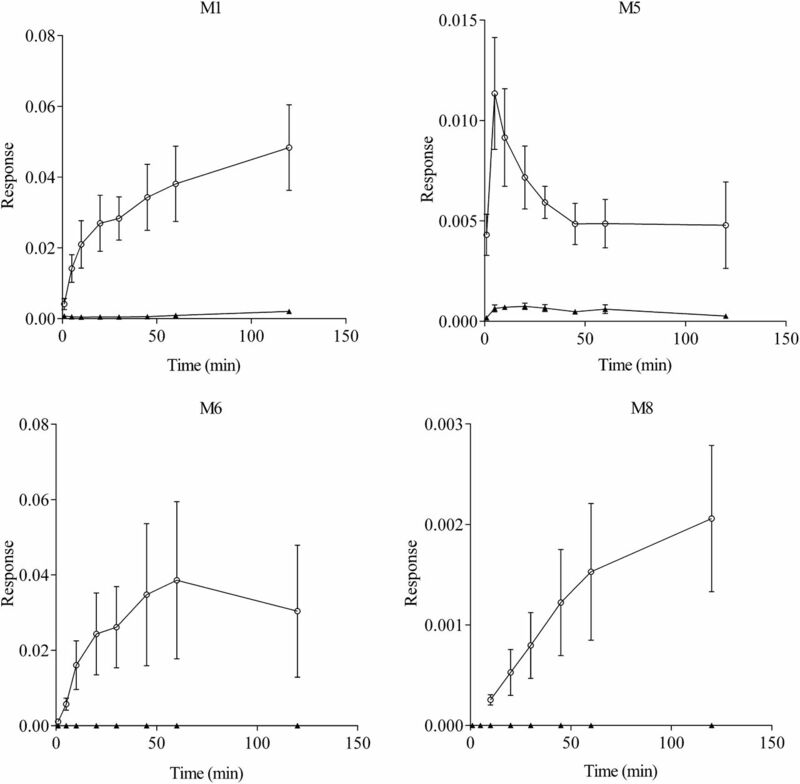 Elimination of terfenadine from hemolymph (A) and calculated AUCs (B). 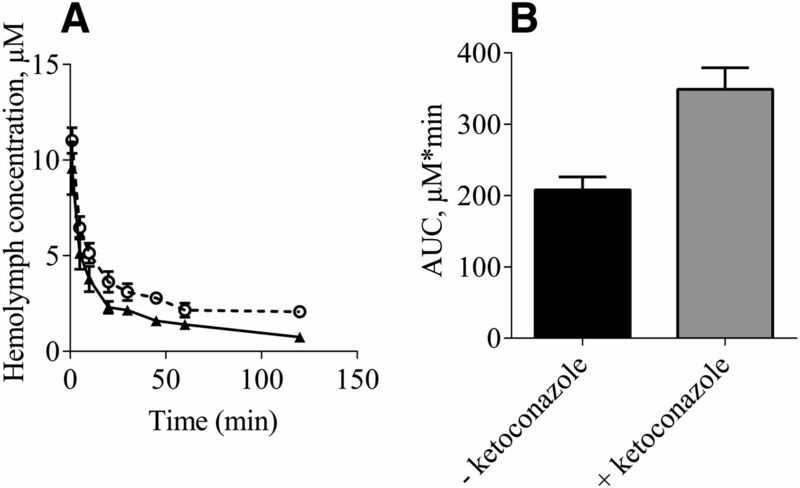 Results with (▴) and without (○) the inhibitor ketoconazole. Data are means and S.E.M. ; n = 6. Major metabolites identical to HLM metabolites identified in locust hemolymph over time. Results with (▴) and without (○) inhibitor. Data are mean and S.E.M. ; n = 6. Major non-P450 metabolites identified in locust hemolymph over time. Results with (▴) and without (○) inhibitor. Data are mean and S.E.M. ; n = 6. 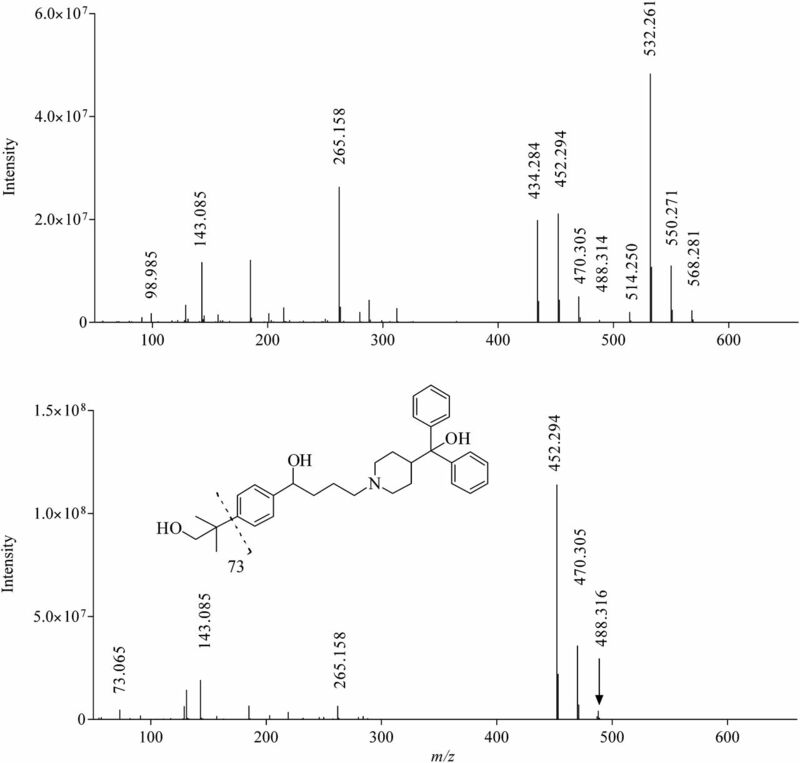 MS response of terfenadine and the most abundant metabolites identified in feces collected from locusts 24 hours after injection (with and without coadministration of inhibitor). 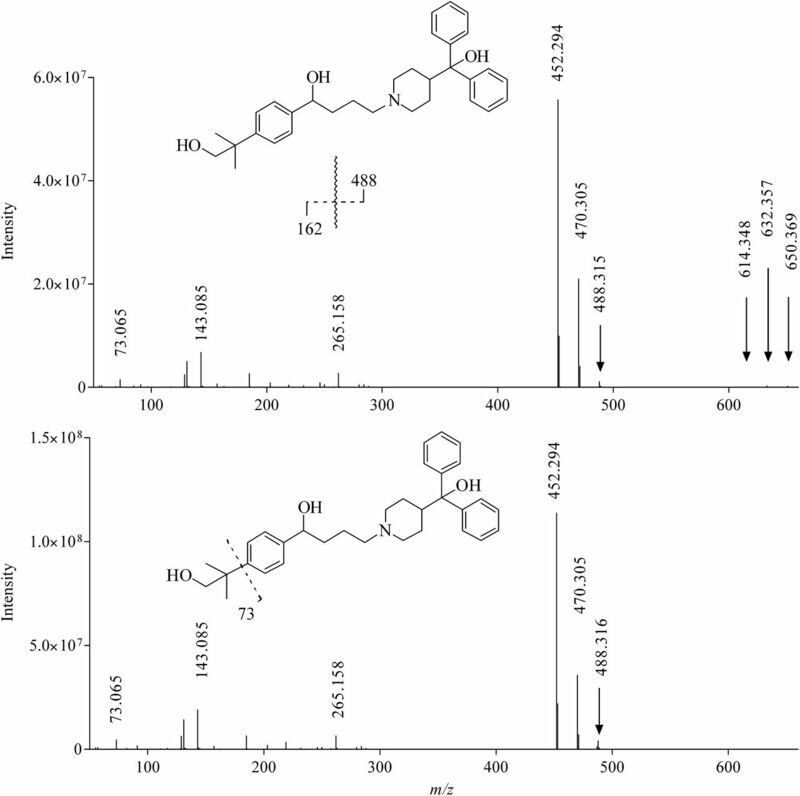 (Left) The metabolites significantly inhibited by coadministration of ketoconazole; (right) the metabolites unaffected or increased. Four locusts per cage. Data are mean and S.E.M. ; n = 3. KTZ, ketoconazole. Fragmentation pattern of M3 (top), with parent mass of 650.369, and M5 (bottom), with parent mass of 488.316. MS/MS spectrum of M9, with parent mass of 568.281 (top), and M5, with parent mass 488.315 (bottom). 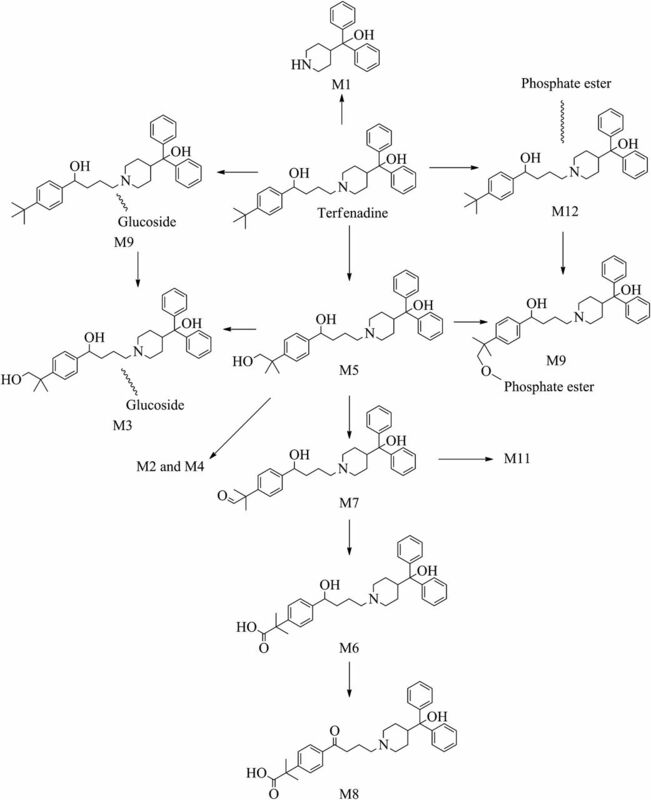 Proposed metabolic pathways and structures of locust metabolites. 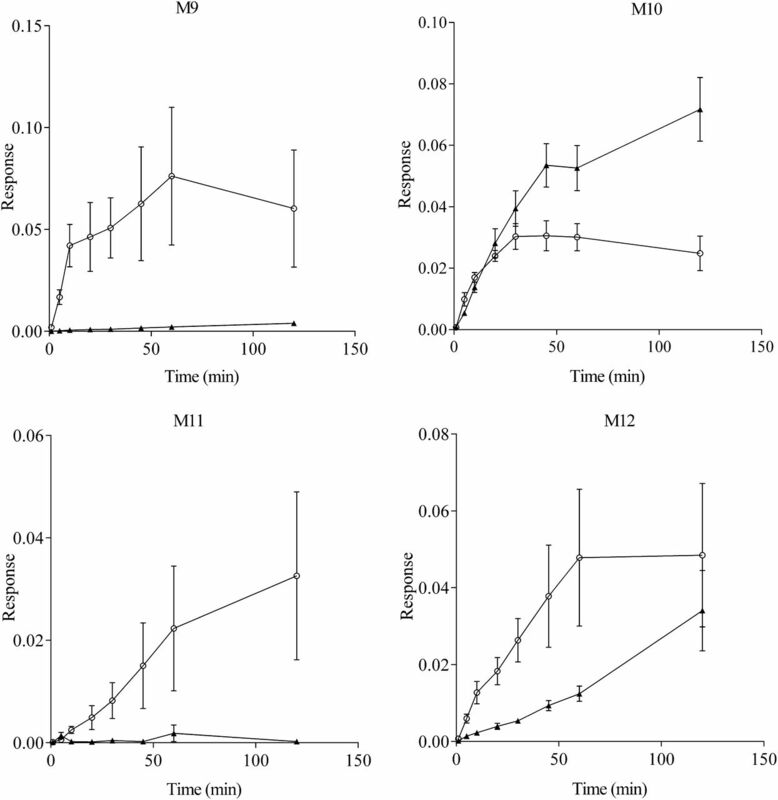 dd-MS2, data-dependent tandem MS; tMS2, targeted tandem MS.